Gov. Jerry Brown has declared a state of emergency in Los Angeles County due to the wildfires burning in the area. The declaration comes amid Santa Ana wind conditions believed to be the worst in a decade, and as a brush fire rages out of the Kagel Canyon area above Sylmar Tuesday. The fire raced across 11,000 acres, destroying about 30 homes and forcing more than 150,000 people from their homes. High winds hindered efforts to get the blaze under control. The blaze, dubbed the Creek Fire, was reported at 3:42 a.m. in the area of Gold Creek and Little Tujunga roads, according to the Los Angeles County Fire Department. The fire consumed 4,000 acres by 8:30 a.m. and blanketed 11,000 acres with zero containment by early afternoon. Fire officials said late Tuesday they would not have an updated acreage figure until Wednesday morning. But as of Tuesday night, at least 30 homes had been destroyed, about 20 of them in the Little Tujunga, Kagel Canyon and Lopez Canyon areas. Throughout the day there was a frantic rush to get hundreds of horses out of the way of the fire. About 800 firefighters were attacking the fire on the ground, but strong, unpredictable winds was making it hard to gain any ground against the blaze. The mayor urged residents to heed orders to evacuate — saying, “Do not wait. Leave your home” — and added that people should be prepared for at least one night away from home. “Do not expect to back tonight,” Garcetti said. An estimated 800 firefighters were on the lines battling the blaze, which was being pushed by sustained winds of 25 mph, along with gusts up to 45mph during the day. Los Angeles Fire Department Chief Ralph Terrazas warned that the firefight is likely to continue until at least Friday. “This has only just begun,” he said. The Los Angeles Police Department, meanwhile, was on a citywide tactical alert, which allows commanders maximum flexibility in deploying resources. One firefighter was hospitalized after a bulldozer rolled over in the Sunland- Tujunga area, but the injury was not considered to be life-threatening. A second firefighter was also injured, with Terrazas telling ABC7 the firefighter was burned when a propane tank exploded. There were no other immediate reports of injuries. “We have no reports of any civilian fatalities or injuries, which speaks to the fact people are evacuating,” county Fire Chief Daryl Osby said. The Foothill (210) Freeway was closed in both directions between the Golden State (5) Freeway on the west and the Glendale (2) Freeway and wasn’t expected to be reopened until at least Wednesday morning. The 210 interchange with the Ronald Reagan (118) Freeway was also closed. As the fire expanded and jumped south of the 210 Freeway, so did the mandatory evacuation area. Evacuations were initially ordered in the area north of the 210 Freeway from Glenoaks Boulevard on the west to the border with La Crescenta on the east. was ordered evacuated in the Shadow Hills area, in a roughly triangular area between Sunland Boulevard to the south, Wentworth Street to the north and Tuxford Street to the west, officials said. — Mason Recreation Center, 10500 Mason Ave., Chatsworth. An evacuation center had been opened at the Sunland Senior Center at 8640 Fenwick St., but that center was closed as the fire closed in. The fire also forced a mass evacuation of large animals, primarily horses but also others such as alpacas. Large-animal evacuation centers at Pierce College, the Los Angeles Equestrian Center and Hansen Dam Recreation Area quickly reached capacity. The Pomona Fairplex also opened its stables for evacuated animals. For small animals, shelters were in place at West Valley Animal Shelter, 20655 Plummer St., and the East Valley Animal Shelter, 14409 Vanowen St. The fire affected a number of schools in the Los Angeles Unified School District, with students diverted to alternate campuses to keep them out of the fire’s path. — Plainview Academic Charter Academy. Los Angeles Mission College’s Main Campus at 13356 Eldridge Ave. and the East Campus at 12890 Harding St., both in Sylmar, were closed for the day. However, the college’s Sunland-Tujunga Campus at 7224 Foothill Blvd. in Tujunga remained open. There was no immediate word if classes would resume Wednesday. Governor Brown is currently in Europe promoting California’s climate policies at the United Nations Climate Conference. Experts from across the globe are weighing in to say that our state could be particularly hard hit by the changing climate, with extreme heat, drought and lack of access to clean water, increased storms and wildfires, sea level rise, and worsening air quality. Here on the ground in California we don’t need experts to tell us how bad things could get, they are life threatening now. Magali Sanchez-Hall, a member of Communities for a Better Environment in South Los Angeles, lives 500 yards away from the Tesoro oil refinery in Wilmington. From her window at night, she can see the sky light up with flares from the refinery. In addition to the five major oil refineries in a nine-mile radius, multiple freeways crisscross her neighborhood, along with busy port complexes that bring heavy pollution. Most of her family suffers from asthma, so doors and windows are kept closed to avoid the toxic fumes. Every neighbor on her street has a household member who has struggled with or died from cancer. The community in Wilmington is not alone. Communities living and working next to polluting factories, oil drilling and fracking sites, industrial agriculture, freeways, rail yards and freight facilities, refineries, and power plants are breathing the dirtiest air in the country, and they are already experiencing the impacts of climate change. These sources of pollution are the largest greenhouse gas emitters, and they don’t just release greenhouse gases — they also release a range of other toxic pollutants. Across California, they are disproportionately located in low-income communities and communities of color, which have less resources to adapt. Communities throughout the state, like those in South Los Angeles and Wilmington, are looking to our legislators to step up their leadership on meaningful climate policies, but the reality is, it’s not happening. The most recent climate policy passed – extending cap and trade until 2030 – contains so many loopholes for polluters that it is unclear what level of decline we will see in California’s actual emissions and whether we will be able to reach our 2030 climate targets. Not only does California’s cap and trade program fail to address air pollution directly at the source, but data from the program reveals that in-state emissions in some sectors have actually risen. Despite reduced emissions overall, the level of smog in Southern California has worsened for the second straight year. This year’s cap and trade deal granted Big Oil major concessions, and the consequences will be felt first and worst in low-income communities and communities of color, like Magali’s, that are right next to our state’s biggest polluters. Both the global climate crisis and the severe health burdens borne by frontline communities require that we stop extracting fossil fuels and thus phase-out both production and consumption. California continues to be one of the nation’s largest oil and gas producers, yet decision makers have failed to create a clear plan to transition off fossil fuels. Without this type of action, conditions will only worsen for more communities across the state. As the Air Resources Board works to design our carbon market, we need to close additional loopholes that will further prevent California from directly reducing emissions. Governor Brown has not made it a priority to transition off fossil fuels, and we must look to community leaders on the ground like Magali as the real climate leaders. We have the right to live in communities where we can breathe clean air, drink clean water, and imagine a future for our children and ourselves. We must improve air quality and public health by cutting emissions directly at the source to effectively address health impacts, reduce asthma rates, and prevent respiratory cancers and other illnesses. By protecting the communities most impacted by pollution and poverty, we can create a healthier environment for all Californians. Only climate policies and solutions that place equity at the center by addressing existing climate and pollution realities of the most vulnerable communities will achieve our collective vision for a healthy, sustainable future. Gladys Limón is executive director of California Environmental Justice Alliance (CEJA). He said the law will effectively eliminate most cooperation and communication between his agency and local law enforcement in California, and prohibit local law enforcement from contracting with the federal government to house detainees. “This bill does not prevent or prohibit Immigration and Customs Enforcement or the Department of Homeland Security from doing their own work in any way,” he said. “They are free to use their own considerable resources to enforce federal immigration law in California. Moreover, the bill does not prohibit sheriffs from granting immigration authorities access to California jails to conduct routine interviews, nor does it prevent cooperation in deportation proceedings for anyone in state prison or for those in local jails for any of the hundreds of serious offenses listed in the TRUST Act. 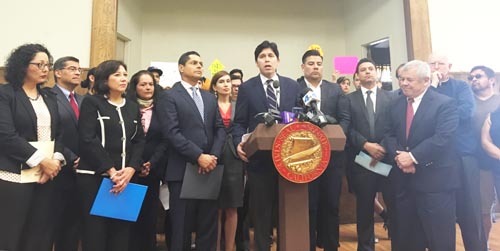 “These are uncertain times for undocumented Californians and their families, and this bill strikes a balance that will protect public safety, while bringing a measure of comfort to those families who are now living in fear every day,” he said. Gov. Jerry Brown got a close-up look Tuesday at the traffic, pollution, and industries that have long wreaked havoc on the health of residents living in southeast Los Angeles County. It was a rare visit by the governor who has in the been criticized for being more interested in opening casinos than protecting the health of residents living in cities like Commerce and Bell Gardens and other east and southeast neighborhoods. Brown was there at the behest of Assemblywoman Cristina Garcia (D-Bell Gardens), who took the governor on a tour of some of the most environmentally challenged areas in her 58th Assembly District. The tour included stops around the 710 overpass at Florence, the perimeter of the Commerce rail yard, Bandini Park and the brownfield at Garfield and Gage (in Commerce). Former Commerce City Administrator Jorge Rifa once told EGP that Commerce is the country’s “third largest port,” referring to the number of shipping containers, diesel trucks and trains that pass through the city, bordered by the Long Beach 710 and Santa Ana 5 freeways and a network of rail yards where trains abut neighborhood homes, schools and parks, as well as industrial warehouses. As a result, several studies in recent years have designated the region as having the most harmful air pollution in the state, or at least being among the top 10 most polluted areas to live. “Today, the Governor got to breathe the same air as I have all my life,” said Garcia in statement following the tour. Gov. Brown “looked across the brownfields that surround my communities and met with my neighbors who share our communities’ concerns,” said Garcia who grew up in Bell Gardens. Brown also took time for a closed door, roundtable discussion at the Neighborhood Youth Center in Bell Gardens where he met with a specially selected group of environmental activists working to improve conditions in predominately Latino communities. The tour and discussion were closed to the media. Many of the activists who met with the governor were involved in the fight to close the now shuttered Exide battery recycling plant, which for decades spewed toxic chemicals into the air, contaminating as many as 10,000 properties in Boyle Heights, Commerce, Maywood, Huntington Park and other areas nearby. State regulators were highly criticized for allowing Exide to operate for decades on a temporary permit and with near impunity, and for their slow response to cleaning up the contamination, a process that is expected to take years to complete. Local officials and community activist demanded action from the governor, but he refused to engage publicly in the process, at one point sparking a demonstration at the grand opening of a Bell Gardens hotel where angry protesters carrying a 10-foot tall papier-mâché effigy of the governor called for him to step up. “Governor Brown comes to Bell Gardens to acknowledge the expansion of the Bicycle Casino but has not acknowledged the contamination of Exide Technologies,” Mark Lopez, director of East Yard Communities for Environmental Justice, said at the time. The tour and discussion come as State Legislators consider extending California’s cap and trade program, which both the governor and Garcia support. However, like many local environmental justice groups, Garcia does not believe the current program does enough to protect local communities from pollution-related health hazards. She is pushing for air quality regulations to be added to the next phase of the program, and has introduced AB 378 in hopes of seeing so-called benefits from program reach the overlooked constituents she represents. “When we talk about California leading the world on climate change, I agree, but we’ve got to really lead by example and address the real and ongoing ramifications in our own backyards at the same time,” Garcia said. The assemblywoman pointed out to the governor that environmental policies the state takes pride in are not visible in her backyard. “You don’t see solar panels on rooftops,” she told the governor, reported the L.A. Times. “Whether it’s electrification or hybrid cars, or cleaner air, you don’t see it. None of those things have been felt here,” Garcia said. “… All Californians should be entitled to an equal piece of justice for their environment. That’s what I believe in and what I shared with the Governor today,” said Garcia Tuesday. California Gov. Jerry Brown took unprecedented action by pardoning three deported war veterans for crimes committed when they returned to civilian life, bringing them hope they will be allowed to return to the U.S., the place they call home. While the governor’s pardons may help in the appeals of their deportations, there is no guarantee immigration enforcement authorities will reverse their decisions. Earlier this year, a petition was sent to the State of California, appealing the cases of Héctor Barajas, Erasmo Apodaca and Marco Antonio Chávez Medina, veterans who were deported to Mexico following the completion of their prison sentences. “These veterans sacrificed their lives to defend our country and were promised full citizenship in exchange for their military service, they should have never been deported,” said Nathan Fletcher, a veteran and the coalition’s leader. Barajas, who came to the U.S. when he was 7, served in the Army from 1995 to 2001. He says he believed he would automatically become a citizen following his service, as he was told when recruited, only later finding out he had to go through the application and testing process before being granted citizenship. He was deported after serving a three-year sentence for shooting at a car a few months after being discharged from the Army. Apodaca was sentenced to prison for robbery after he was found inside his ex-girlfriend’s house, while Chavez Medina was sentenced to two years for animal cruelty, but released early for good behavior. Jennie Pasquarella, director of immigrant rights at the American Civil Liberties Union (ACLU), said that with the pardon, California’s governor has put an end to the suffering of the three ex-combatants. It’s been nearly two months since state lawmakers assured residents they would within two weeks introduce “urgency legislation” to appropriate the funding proposed by Brown, a commitment they made good on Wednesday with the introduction of the “Exide Clean-Up Package” in the Assembly and Senate. Under AB 118, authored by Majority Whip Assemblyman Miguel Santiago, and the Senate version authored by Senate President Pro Tempore Kevin de Leon, SB 93, the state would immediately appropriate a $176.6 million loan to the Department of Toxic Substances Control to be used for cleanup of east and southeast communities contaminated with lead and other toxic chemicals by the Exide plant in Vernon. The bills are expected to land on the governor’s desk by the end of next week, and all accounts are that he will sign it. “This is an aggressive bill and timeline,” said Santiago, who kicked off the process by talking up the merits of the bills during a special meeting of a budget subcommittee Wednesday morning. “I stand by my original statement that we are looking for the fasted, highest quality process to speed up the cleanup efforts,” Santiago told EGP Wednesday. The assemblyman, who represents most of the communities contaminated by the Exide plant, including Boyle Heights, East Los Angeles, Vernon, Maywood and Huntington Park, was a regular face at DTSC hearings and meetings. His bill, AB 118, gives DTSC access to the funds through June 2018, a date which Santiago’s chief of staff, Jackie Koenig, told EGP is included as a budget mechanism, explaining funds will still be available to DTSC after the 2018 date if needed. The multi-million dollar loan can only be used for cleanup related activities, including testing and the CEQA environmental review process, as well as for job training of local hires and any costs related to the recovery of the funds from potentially responsible parties, including Exide. It also mandates that DSTC keep the public informed of its progress by regularly posting on its website the number of property access agreements received, properties sampled and properties remedied. The state regulatory agency will also be required to update state legislators on the cleanup effort and provide a summary of their findings during DTSC’s annual funding requests. DTSC is preparing to begin the environmental impact report (EIR) process and hopes to begin the cleanup of residential properties, schools, daycare centers and parks in the 1.7-mile radius surrounding the battery recycling plant by late spring 2017. The EIR is required under the California Environmental Quality Act (CEQA), which mandates state and local agencies identify significant environmental impacts and mitigation to the community. 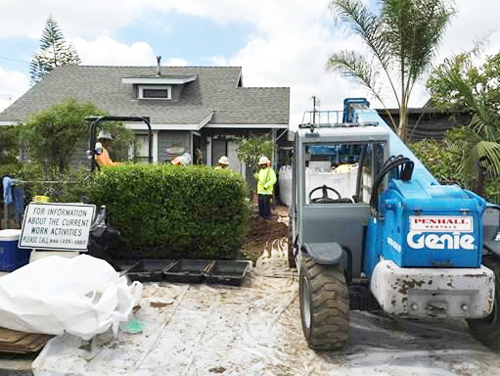 Initially, there was a proposal to exempt the community cleanup from the CEQA process out of concern that it could further stall the process to remove lead, arsenic, and other potentially dangerous chemicals from area homes and other properties. However, last week, DTSC Director Barbara Lee, speaking to the Assembly Budget Subcommittee for Resources and Transportation, said it’s the wish of community leaders and environmental groups to not exempt the Exide cleanup from CEQA process. The initial thinking was to give the cleanup the highest priority as quickly, effectively and safely as possible, she said. The environmental review process will begin in early May with a 30-day public review of the notice of preparation, followed by a public scoping meeting later that month, according to DTSC. The agency estimates it will release a draft EIR sometime in October. Assuming no extensions are granted, the public will have 45 days to comment on the DEIR in writing or during a public hearing. DTSC estimates it could release a final EIR for public review sometime in March 2017 and certify the document in by April, if there are no delays. 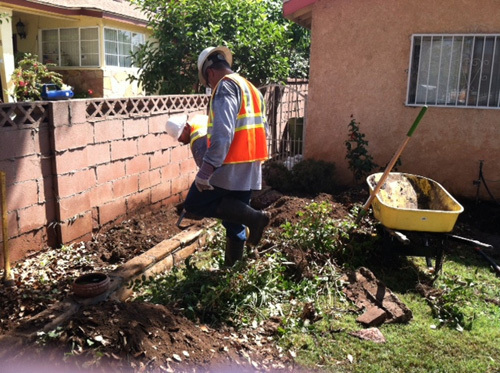 The state agency is currently sampling and cleaning properties using the $7 million it received from Exide last summer. The CEQA process would not effect future testing, which would continue while the EIR is being approved, according to DTSC. Congressman Xavier Becerra, who also serves the impacted areas and serves as Chairman of the Democratic Caucus, applauded Governor Brown’s recent decision not to exempt the Exide lead cleanup from the CEQA review process. To date, over 1000 properties in the area surrounding Exide have been sampled and over 200 properties have been cleaned, according to DTSC. Marquez believes that is still too little, too late. “I don’t know why it’s taken so long, you would think by now they would be further along,” she said. Santiago agrees and says he is concerned that the remediation process could be prolonged. “Every day we wait is a day our community doesn’t get justice,” he told EGP. DTSC should have taken good notes throughout the dozens of public meetings conducted on the issue, Santiago told EGP, referring to testimony already available on the impact of Exide’s toxic polluting as well as concerns about potential risks during the cleanup process. “We need to make sure we get this right on the front end so we don’t run into the same problems,” he said. Update 11:45 a.m. This post has been updated to include a statement from Congressman Xavier Becerra. In front of a boisterous downtown Los Angeles crowd of legislater, union leaders and workers who have been fighting for increased salaries, Gov. Jerry Brown signed legislation Monday that will raise the state’s minimum wage to $15 an hour by 2022. Brown, during a ceremony at the Ronald Reagan State Building, said the passage of SB 3 doesn’t mark the end of the struggle for livable wages, but it’s a big step in the right direction. The state Assembly and Senate both approved the legislation Thursday, despite opposition from Republicans and business leaders. Under the legislation, California’s $10-an-hour minimum wage will increase to $10.50 in January 2017, then to $11 on Jan. 1, 2018. The minimum wage will then go up by a dollar in each of the following years until it reaches $15 in 2022, after which it will continue to rise each year by up to 3.5 percent to account for inflation. Businesses with 25 or fewer employees get an extra year to raise their wage, so that workers will be paid $15 by 2023. The plan also gives the governor the ability to temporarily halt the raises if there is a forecasted budget deficit of more than one percent of annual revenue, or due to poor economic conditions such as declines in jobs and retail sales. Government workers who provide in-home health services will receive an additional three paid sick days under the plan. The wage hike will affect 5.6 million workers, or about one-third of the statewide workforce, officials said. The proposal is similar, although slightly slower, than an already approved increased in the city of Los Angeles minimum wage. Under the city ordinance, the minimum wage will increase to $10.50 on July 1 and eventually reach $15 per hour in 2020, with future increases pegged to the Consumer Price Index. The same wage hike schedule was also adopted for the unincorporated areas of Los Angeles County. The unrelenting efforts of residents and community activists deserve credit for California Gov. Brown and state legislators securing nearly $177 million for testing and cleanup of properties contaminated by the Exide Technologies plant in Vernon, state and local Latino leaders said today during a news conference at Resurrection Church in Boyle Heights. “This is what community looks like,” proclaimed Senate Pro Tem Kevin de Leon, pointing to the group of residents and activist at his side and in the audience. He was referring to the people from Boyle Heights, Commerce, East Los Angeles, Maywood and other southeast communities who have spent decades fighting for the state to hear their pleas for justice for the men, women and children being poisoned by high levels of lead, arsenic and other contaminants from the now closed acid-lead battery recycling plant. After years of silence, Gov. Brown publicly acknowledged the Exide contamination for the first time Wednesday when he asked state legislators to allocate $176.6 million from the general fund for testing and cleanup on the eastside. The funds, once approved by the California State Senate and Assembly Budget and Appropriations Committee, will come in the form of a loan. The state will then go after Exide and any other parties responsible for contamination to recover the costs. The funds will expedite and expand testing for up to 10,000 homes and remove lead-tainted soil from 2,500 residential properties, schools, daycare centers and parks in the 1.7-mile radius surrounding plant. The multi-million spending plan would increase the number of crews assigned to the week-long cleanups from 2 to 40, according to Barbara Lee, director of the Department of Toxic Substances Control. Many residents have told EGP over the years they are frustrated with inept oversight by the DTSC, and today, many still say they do not trust the agency to handle the funds or the cleanup moving forward. DTSC allowed Exide to operate for decades on a temporary permit, even after repeatedly being found to have exposed more than 100,000 people to dangerous levels of lead, arsenic and other chemicals and collecting dozens of hazardous waste violations. “Let me clear, there is no safe level of lead,” de Leon said today. Councilman Jose Huizar, who represents Boyle Heights, one of the most severely impacted communities, said he’s anxious to see a timeline for the testing and cleanup process, now that funds will finally be available. He wants strict oversight of state regulators, who have moved slowly to protect the community. Assemblywoman Cristina Garcia noted that the funds are “just a down payment, not just in funding but the work from elected officials.” Estimates put the entire cleanup at $400 million, possibly making it the costliest environmental catastrophe in California history. De Leon told EGP that he has serious concerns about the toxics substances control agency’s ability to handle the cleanup, and said that question would be part of his negotiations with governor’s office moving forward. As EGP first reported, residents and community activists had grown increasingly frustrated and angry over the “double standard” they observed in the treatment of the mostly-white, affluent Porter Ranch gas leak and the blue collar, and the predominately Latino communities affected by Exide’s lead contamination. They were angry that there had been no public statement from Brown, and the slow pace of the decontamination process. It was just a few weeks ago that L.A. County Supervisor Hilda Solis said she had tried to reach the governor to ask him to allocate $70 million for the cleanup, but he was unresponsive. “I called the governor and thanked him for the funds,” she said today about his turnaround. “I also invited him to come and see what’s going on,” she said in Spanish. “He said ‘we’ll see,’” she said. Sen. Ricardo Lara (D-Bell Gardens) said pressure from the community made the difference. “The community kept elected officials on task,” said Lara. “I want to personally thank EGP and the Eastside Sun for their incredible investigative journalism for bringing bright sunshine to residents of Boyle Heights and to this incredible environmental crisis,” said de Leon. Rev. Monsignor John Moretta earlier in the week told EGP that when the community gathered to celebrate the closure of the Exide plant last year, they thought it was a victory. They have since realized that the real work was still ahead. The same can be said about the state’s funding now, he said. Moretta and several other people said they want an investigation into state regulators and for Los Angeles’ city attorney and the state attorney to bring legal action against Exide, which has abandoned toxic waste sites in five other parts of the country. This is not the end, he said. In the end, the event was intended to be a recognition of the community’s activism. U.S. Rep. Xavier Becerra said holding the celebration at Resurrection Church was fitting. 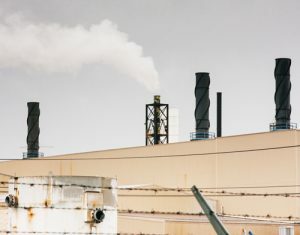 For years, communities surrounding the now-shuttered Exide Technologies plant in Vernon have fought to be heard: first to force the closure of the facility and then to ensure a thorough, swift cleanup of neighborhoods contaminated by toxic emissions — something many believe was stalled due to a lack of funding and sense of urgency on the part of state officials. On Wednesday, Gov. Brown at long last took a major step to address Exide’s contamination by proposing the state spend $176.6 million to expedite and expand testing and cleanup of residential properties, schools, daycare centers and parks in the 1.7-mile radius surrounding the battery recycling plant. The multi-million dollar spending plan is detailed in a letter to the California State Senate and Assembly Budget and Appropriations Committee chairs. The funds will be in the form of a loan from the General Fund, and California will “vigorously pursue Exide and other potential responsible parties to recover the costs of this cleanup,” according the governor’s office. Barbara Lee, director of the state’s Department of Toxic Substances Control told reporters Wednesday the new funding will allow DTSC to hire more staff to test the remaining properties in the contamination zone and to remove lead-tainted soil from 2,500 properties labeled highest priority. So far, close to 200 homes in Boyle Heights, East Los Angeles, Commerce, Maywood and Huntington Park have been cleaned since the plant was forced to close in April 2015, according to DTSC. Currently, DTSC only has two crews assigned to the large-scale decontamination, but Lee said that number could go up to as many as 40 crews cleaning at least one property each per week. Senate leader Kevin de Leon applauded the governor for recognizing the “urgent need” for emergency action. Ongoing talks with the governor’s office led to this day, the senator said. “Urgency legislation” to appropriate the funding will be introduced within the next week or so, de Leon told reporters. While the governor’s proposal is widely welcomed, it’s also bittersweet. Especially for residents and environmental activists who for years heavily criticized Brown and state agencies overseeing the cleanup for their slow response to the Exide “epidemic,” which may have contaminated 10,000 homes and exposed as many as 2 million people in East and Southeast Los Angeles communities to toxic levels of lead, arsenic and other chemicals. Brown’s long silence on Exide irked eastside residents who saw his rapid response to the SoCal Gas Co. gas leak in more affluent Porter Ranch and emergency declaration to marshal state resources to deal with the catastrophe as confirmation that there’s a double standard when it comes to the treatment of poor people and communities of color. “Our communities have been fighting Exide for decades, and with today’s announcement from Governor Brown, it is clear he has heard our calls for swift and comprehensive cleanup,” said Mark Lopez, executive director of East Yards Communities for Environmental Justice. Lopez, however, pointed out that the funding is not enough to complete the entire cleanup, but called it the “next step in the long road to justice on this issue” after the state failing for years protect the community from Exide. It sends a clear message that the cleanup will now be a priority for the state, Lopez said. Brown’s proposal comes just two days after a group of Boyle Heights residents told EGP they had grown tired of attending meetings and hearings, and felt it was time to get the weight of the federal government behind them after seeing no real action for years from their elected officials. “We need the federal government to take DTSC out of the equation and handle it themselves,” Terry Cano said Monday. “I think they believe if they close their eyes and ignore it, we’ll just die out,” said Joe Gonzalez, who says he has cancer and just two months to live. They blame state regulatory agencies for allowing Exide to operate for 33 years on a temporary permit, all the while spewing toxic levels of lead, arsenic and other chemicals known to cause cancer and neurological diseases and learning disabilities in the mostly working-class communities. Last Friday, saying he too had grown impatient with DTSC, Los Angeles Councilman Jose Huizar intruded a resolution signed by five of his colleagues urging the state to move quickly to allocate funding. Huizar, who represents and is himself a resident of Boyle Heights, also asked that City Atty. Mike Feuer explore what if any legal options the city has. Huizar said Wednesday the much-needed funds “do right by communities that for so long suffered undue harm because of Exide’s negligence and a complicit state agency that failed to regulate the battery recycling company,” He’s looking forward to seeing a timeline that spells out when testing and remediation will start and how long it will take. Lee responded to criticism of the governor Tuesday night at a meeting of the Independent Exide Community Advisory Committee. “He’s spent hours talking about Exide, working on what he wants to propose,” she said before alluding to an impending announcement. Yesterday she told reporters Brown’s proposal is a “big milestone” for the state and an indication of how committed the governor is to the cleanup. De Leon said Wednesday that the state would work closely with the U.S. Attorney to ensure Exide lives up to its agreement to pay for the cleanup, or face federal criminal charges. Congresswoman Lucille Roybal-Allard implored state legislatures to immediately approve funding to expedite the cleanup. The city of Commerce released a statement calling the contamination an “environmental disaster,” adding the testing and cleanup has been a “long and arduous process.” On Tuesday, the council asked staff to discuss with the state expanding its targeted areas in Commerce. “This long-fought victory is a result of Assembly, Senate and local officials working together to raise the fierce urgency of this issue to the Governor,” said Assembly Speaker-Elect Anthony Rendon (D-Paramount) said in response the Brown’s proposal. Garcia said Wednesday she plans to work with her colleagues to create a necessary CEQA exemption to expedite the testing and cleanup of these homes. Garcia and Assemblyman Miguel Santiago also plan to introduce legislation to mandate a fee on car batteries sold in California. “This measure would create a state mandated Lead-Acid (Car) Battery Recycling program, and have $1 from that fund go to re-pay the $176.6 million loan program,” she announced. In addition to testing and cleanup, Lee said some of the $176 million would go toward workforce development and job skills training for local residents and businesses to help revitalize the community. Lee also announced the state is looking at ways to improve how they manage waste and reduce the exposure of lead, adding staff is currently identifying how manufacturers can make batteries safer for humans and the environment. Brown’s announcement came after the Los Angeles County Board of Supervisors voted to send a letter to the governor and legislative leaders, calling for them to allocate more funding for the cleanup effort, saying the $8.5 million originally proposed by the governor was inadequate. Last week for the first time since taking office, Los Angeles Mayor Eric Garcetti met with Boyle Heights residents disappointed by the city’s lack of action on their behalf. Garcetti told EGP he has directed the L.A. Bureau of Sanitation to work with community leaders, County Public Health and DTSC to help advance testing and cleanup and plans to launch a public education effort to ensure that more residents are tested for lead contamination. DTSC’s Assistant Director for Environmental Justice and Tribal Affairs Ana Mascareñas said the agency is considering holding large-scale events such as health fairs and opening resource centers to allow residents to drop in and get information about the cleanup process. 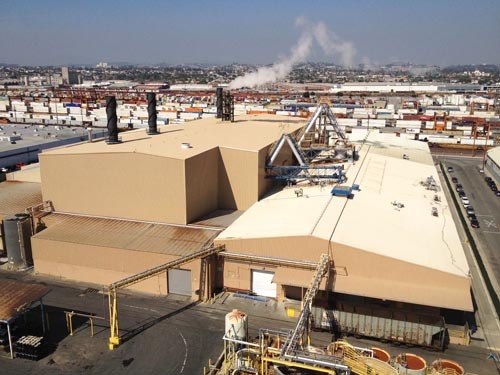 Exide agreed in March 2015 to close its lead-acid battery recycling plant and pay $50 million for cleanup of the site and surrounding neighborhoods. Of that amount, $26 million is to be combined with $11 million currently in trust to safely close the plant, according to DTSC. As of August, Exide, which filed for bankruptcy in 2013, had paid $9 million into a trust and another $5 million is due to be paid in by March 2020, according to state officials. Longtime Boyle Heights resident Frank Villalobos told EGP he was elated by the announcement but pointed out the funds will only address the impact to property and not the permanent damage residents face with illnesses caused by the contamination. In a letter to State Legislators, Gov. Jerry Brown today proposed spending $176.6 million to expedite and expand the testing and cleanup of homes, schools and parks near the now-shuttered Exide battery recycling plant in Vernon. The $176.6 million will ensure the Department of Toxic Substances Control is able to test properties, homes, schools, daycare centers and parks within the targeted 1.7-mile radius of the now shuttered battery-recycling plant in Vernon, and remove soil from properties with the highest levels of lead-contaminated soiled, according to the governor’s letter. The announcement comes following months of growing frustration and heavy criticism by residents, environmental activists and state and local elected officials over the governor’s long silence on Exide, particularly in the wake of his rapid response to the SoCal Gas Co. gas leak in more affluent Porter Ranch, and emergency declaration allowing the state to shepherd state funding and resources to deal with the catastrophe. For years, despite repeated violations of polluting air emissions and handling of hazardous waste, the state had allowed Exide to operate on a temporary permit, allowing the company to continue to decades spew toxic levels of lead, arsenic and other chemicals known to cause cancer and neurological diseases in the mostly working-class communities of Boyle Heights, Maywood, Commerce, Bell, Huntington Park, and East Los Angeles. Senate Leader Kevin de Leon today applauded the governor for recognizing the “urgent need” for emergency action. Ongoing talks with the governor’s office led to this day, the senator said. “Urgency legislation” to appropriate the funding will be introduced within the next week or so, De Leon told reporters. “Our communities have been fighting Exide for decades, and with today’s announcement from Governor Brown, it is clear he has heard our calls for swift and comprehensive cleanup,” said Mark Lopez with East Yards for Environmental Justice. He said the governor’s announcement is a clear message the cleanup will now be a priority for the state, after years of failing to protect the community from Exide. DTSC Director Barbara Lee, responded to criticism of the governor Tuesday night at a meeting of the Independent Exide Community Advisory Committee. “He spent hours talking about Exide, working on what he wants to propose,” she said, before alluding to an impending announcement. Today she told reporters the proposal was a “big milestone” for the state and an indication of how committed the governor is to the cleanup. Brown’s announcement came one day after the Los Angeles County Board of Supervisors voted to send a letter to Brown and legislative leaders, calling for them to allocate more funding for the cleanup effort, saying the $8.5 million originally proposed by the governor was inadequate. “The state’s numbers indicate that the cleanup could cost hundreds of millions of dollars,” said Supervisor Hilda Solis, who said publicly in the past the governor had not responded to her efforts to get him to allocate more state resources to the cleanup. Exide agreed in March to close its lead-acid battery recycling plant and pay $50 million for cleanup of the site and surrounding neighborhoods. Of that amount, $26 million will be combined with $11 million currently in trust to safely close the plant, according to DTSC. As of August, Exide, which filed for bankruptcy in 2013, had paid $9 million into a trust and another $5 million was due to be paid in by March 2020, according to state officials. As many as 1,000 homes may be found to have toxicity concentrated enough to qualify as hazardous waste, and the state has estimated that 5,000-10,000 homes may ultimately require some cleanup. The plant, which produced a host of hazardous wastes, including lead, arsenic and benzene, operated for 33 years without a permanent permit. Efforts to upgrade the equipment and safety procedures repeatedly failed to meet environmental standards. Though gaseous plant emissions are no longer an issue, lead contamination in the soil, which can cause developmental delays and cognitive impairments, remains a concern. A public health spokesman has also cited the increased risk of cancer linked to other chemicals once emitted by the plant. Boyle Heights and Maywood have the highest levels of residential contamination, but the area of exposure stretches to encompass roughly 2 million people, according to Angelo Bellomo, director of the county’s Environmental Health Division. Information from City News Service used in this article.